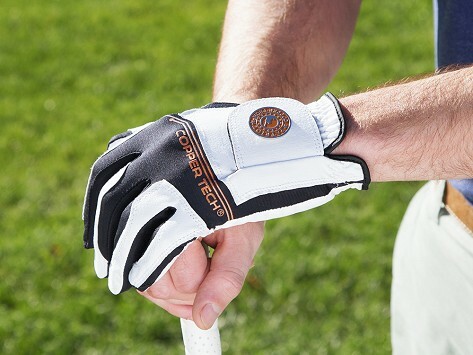 The men’s golf glove from Copper Tech is designed to make your hand feel better when you’re swinging on the course. Compression helps boost circulation, which can ease aches and muscle fatigue and the copper infused in the material is thought to relieve joint pain. A non-slip extra-grippy silicone grip means needing less tension to grip your club and form flex technology gives you a custom-fit feeling. Dimensions: Regular: 8.5" x 3.9" x 0.3"; XL: 8.9" x 4.1" x 0.3"
Was a gift but he was anxious to give it a try!